Very nice year this tandem had. I figure Boston's Rask and Halak had to be right up there as well, but the Isles' netminders winning it shouldn't surprise anyone. A good defensive system in front of them and both guys backed it up by being consistently stingy, game in, game out. Of course, the BIG questions are, how effective they will be in the playoffs and will it be enough to carry the team if the offense falters? They get big tests right out of the gate staring down Sidney Crosby's crew in Round 1. But as for their regular season achievement as a duo, very well done. 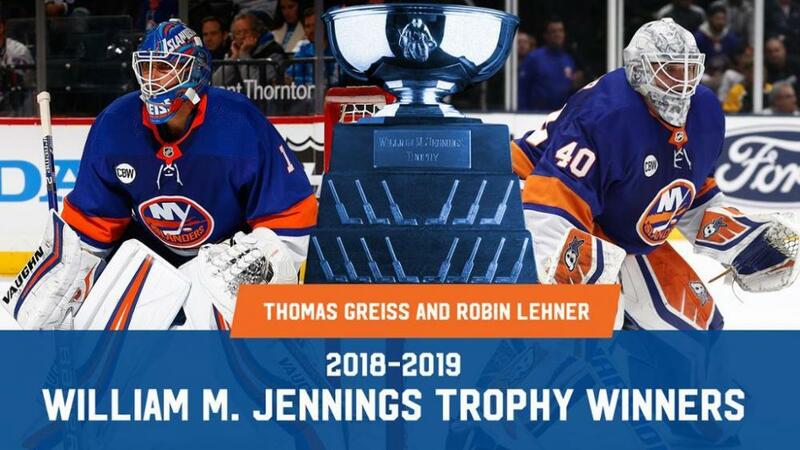 I DO have to wonder though...in the case of Tomas Greiss….did he play over his head, or did he simply find the right coach and system that suited him? And will he be able to repeat this moving forward? Will he want to be the de facto starter, and if he does, will it be with the Isles, or somewhere else? Has he FINALLY reached the potential that many thought he had before labeling him a 'bust' with the Sens and Sabres? Can HE consistently perform like this moving forward, and is he now the product of the system in place, or is he that damned good even without it? Guess those are things we will see soon enough, starting with the post season, then moving into next year. But no doubt, these two were reasons Isles fans can be proud of their team this year.